We have a couple of days before Christmas and if you are still looking for healthy Christmas Sweets Ideas then maybe you should consider the popular Goan Dodol. It’s not only popular in Goa but also in South East Asia. You can also make it gluten-free by replacing wheat flour with millet / ragi flour and since it does not have any eggs or milk it can be vegan. In my short trip to Goa, I managed to visit the St Francis Xavier Exposition and celebrate the Immaculate Conception Feast. My unexpected short visit could not have been better timed, as the Exposition is once’s every 10 years and according to my mum St Francis 15th generation family members delegate came to Goa for the Expo. 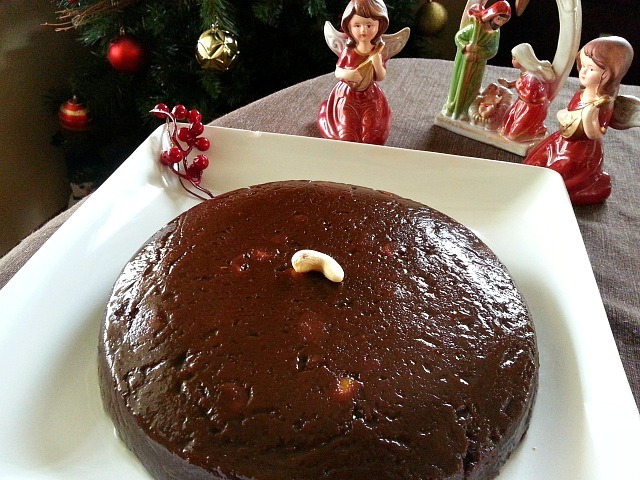 The dark rich pudding with an intense flavor of coconut and jaggery sure puts you in a Christmas mood right away. 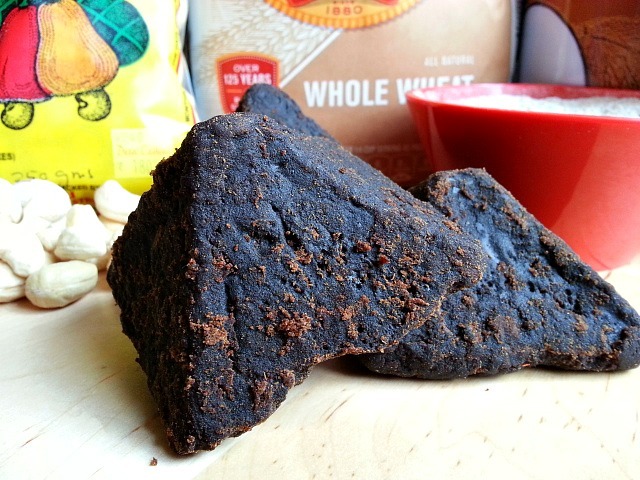 Goan dodol is not baked but cooked on slow fire till it has a jello consistency. Goan’s make the dodol in 2 ways either they use wheat flour or millet flour, rice flour is usually used in a small quantity for texture. Kalu Dodol in Sri Lanka is made with rice flour. My humble opinion is that using rice flour makes the Dodol firmer but the Goan dodol is softer and a little sticky, which I prefer. This 5 ingredient sweet is very simple to make but requires a tad bit of patience. Use a non stick pot and a wooden flat spoon if possible. Mix the flours, 2 cans of coconut milk and salt in a pot and place on medium heat. Stir slowly till the mixtures thickens approx 15 minutes. 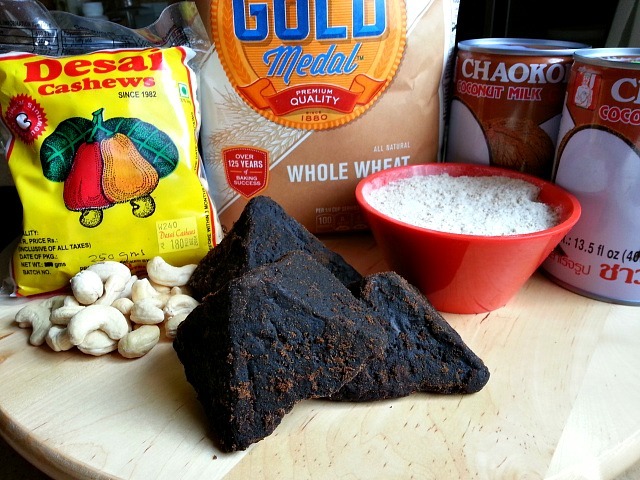 Next add jaggery, cashews and the remaining can of coconut milk. Stir slowly on low medium heat for approx 1.15 hrs till the mixtures leave the side of the pan and does not stick to the wooden ladle. If the dodol does not let oil then add butter towards the end. Pour into a 9″ round and smooth it with the wooden spoon to form a nice round. Cool and enjoy. Leave it in a cool dry place or the refrigerator for a week or two. 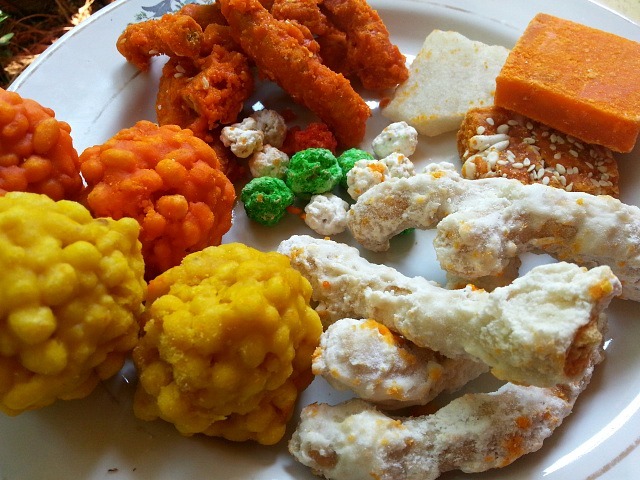 Check out more Goan Sweets like Bebinca, Doce de Grao and Neureos. Hi Nandini. I see you are now following my retiredanddownunda blog. Thanks for that, but that is an old blog that is full and there will be no new posts. You are certainly welcome to cruise back through the old posts, if you wish. My current blog is confusedandamusedsite, which I believe you been on. Cheers. Hi Sharon each cans we get here are 400ml so you would need 1.2 liters of coconut milk. Hope this helps. By “cans” of coconut milk how many mls/litres do u mean ? Thanks for stopping by. Your blog is really mouth watering. Please keep those recipes coming!!! Yum yum yum yum yum yum yum….. This looks great! Very interesting post! You are very welcome Dan and Wishing you a Happy New Years! I have never been to Goa, even though it’s been on my bucket list for sometime. Have tried vindaloo and Goan sausages, and I’m curious to try more Goan cuisine. Dodol fairly resembles a Dulce de Leche in preparation I think. Jaggery + coconut milk = awesomeness ! Thank you Ms Di. 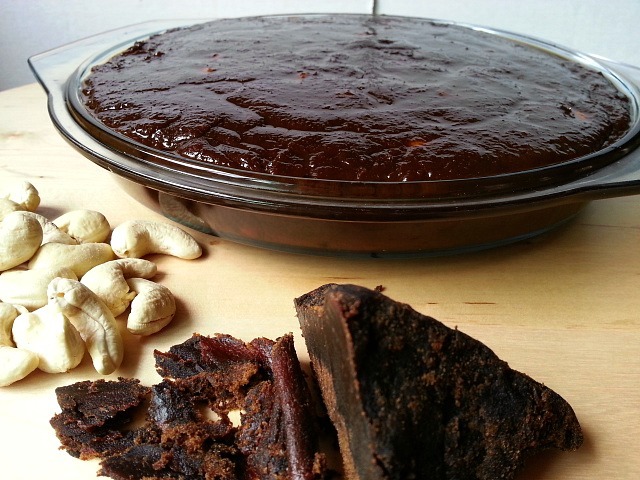 Dodol is almost close but it does use some wheat or red millet flour as the thickener. Looks so rich and beautiful. Yum. Thanks for stopping by my blog. Very interesting! Nice photos too! Oh Cynthia, how I wish I could. Teleporting is the next technology that Elon Musk is working on so hopefully soon my friend 🙂 Have a lovely weekend! Love the look of this dessert Nandini – I’m going to try it. A Burmese friend of mine makes something similar and I’ve always enjoyed that. Thank You Ash for your kind words :-). Thank You Shinta and yes it is made very similar to the Indonesian one :-). Happy New Years to you! Thank You and wishing you too a very Happy and Healthy New Year. love this recipe. have never used coconut jaggery. what an awesome moist delightful dish! Yummmy! Have a very Happy New Year! Beautiful creation Nandini ,the cake is so tempting and looks delicious.Blessed and happy 2015. Thank You Jalal. Wishing you too a very Blessed and Happy New Year. Merry Christmas – what a fabulous looking cake! I have never heard of coconut jaggery. However, I will try with light brown sugar that is readily available here in US supermarkets. Hope the Dodol will come out as good as per your recipe. Coconut Jaggery is not available here. I get mine when family visits or when I go down. Brown sugar with some molasses may do the trick in terms of color. If you do try it please let me know. Thanks for sharing this is something that I will definitely try. The jaggery pictured – is it that colour because it is coconut jaggery? It makes the cake a lovely colour. Could I use palm sugar? Candace, in Goa we get 2 kinds of jaggery one is Coconut Jaggery which is darker and the light golden one is palm. About the color I am not sure why it is so, but I will find out. I haven’t tried out with palm sugar but I think it may work. If you do use it please let me know how it turns out for you. This looks really interesting. I can’t wait to play around with it. It is, specially since a lot of folks have not been exposed to it but it is really good and has a nice aroma of coconut. My sister has a gluten allergy and I know she would absolutely LOVE this! Thank you with Happy Holidays. Merry Christmas to you as well Kim. I hope your sister will give it a try. My god that looks yummy! This looks yummy! Unfortunately I have no idea where to get jaggery in the east coast of Canada 😦 I still plan on trying your bebinka recipe this christmas! That is so awesome. Let me know how the Bebinca comes out. I am making mine tomorrow. If there is any Indian store close by than you may find a golden colored jaggery which you can use as well. It will give the dodol a nice gloden brown color. It is… :-). My husband finished it in 2 days. Oh gosh, I’m drooling here Melissa, love dodol, I wish you lived closer. By the way, once the holidays are over, I do have the guest post that you requested prepared, so perhaps we can get together on that in the New Year. Merry Christmas to you and your loved ones. 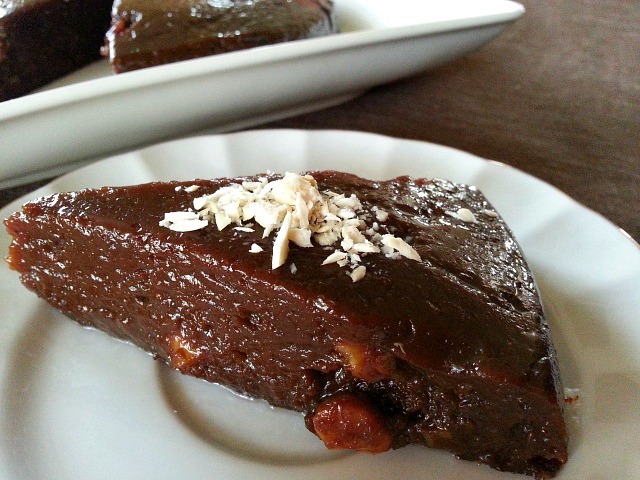 Nandani, this dessert looks so moist and delicious! Yum! I had to look up ‘jaggery’ and was disappointed to discover its sugar. I like the moist look of this dish so much, I’m trying to think of a suitable alternative(we are sugarfree – I know we may have to add some but I was hoping not to add whole lot). How very interesting…and perfect to bring to my yoga studio’s party where there are lots of vegans!